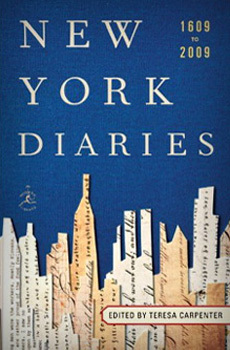 I received this recently as a re-tweet from the NYPL. What a beauty! 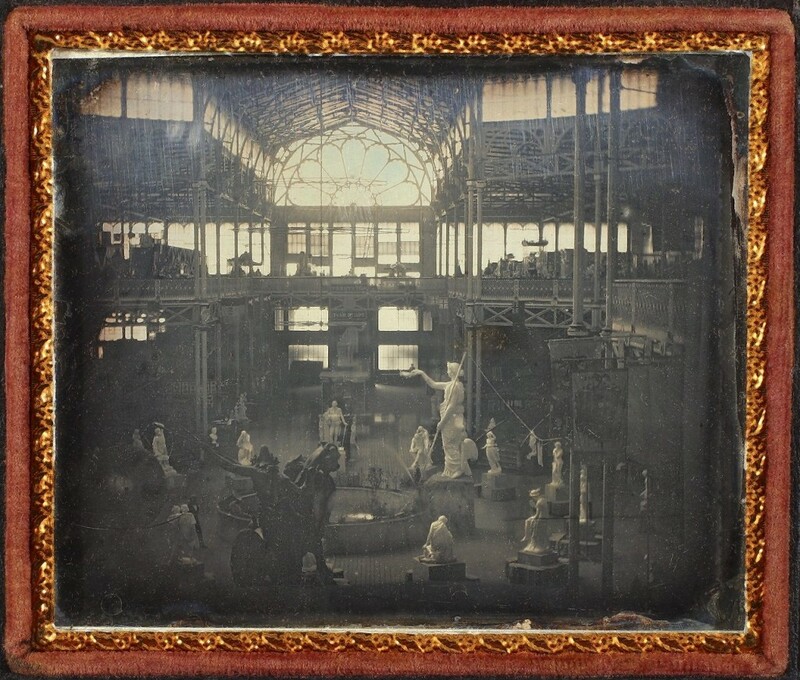 It’s a rare daguerreotype of the interior of New York’s long-since-destroyed Crystal Palace. The “Palace” was a fabulously surreal structure erected as part of New York’s 1853 Exhibition of the Industry of All Nations. 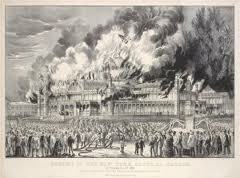 London had thrown its own Great Exhibition three years earlier. 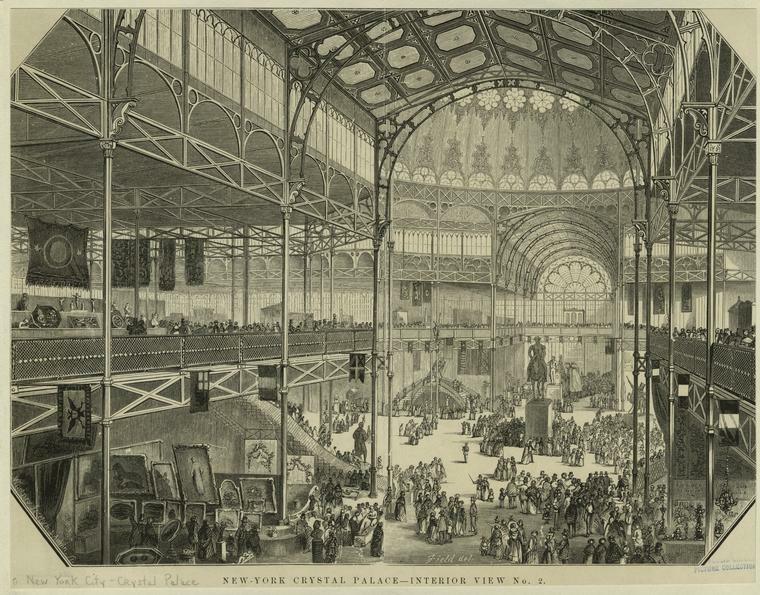 The hall of wonders was an enormous “Crystal Palace” gracing Hyde Park., The British fair’s impressive display of art and manufactured goods was so successful that the capitals of Europe and New York City followed suit. The city fathers of New York apparently wanted to erect their own palace, smaller and less expensive then the English model, but one that was nonetheless gasp-worthy. So on the site of what is now Bryant Park they installed a delicate confection of cast iron and glass. The palace dome, over sixty feet high, was supported by twenty-four iron columns set with over thirty enameled and finely-etched panes. The finished structure contained roughly 10,000 of these translucent panels. Miraculously, all 2,000 visitors inside got out alive. The daguerreotype, owned by the New-York Historical Society, is identified only as having been taken by an unknown photographer during the mid-1850’s. This was most certainly l854 or thereafter since the statuary shown here was introduced during a “renovation” that year. The central figure is called the “Genius of America” inspired by a figure on the pediment of the U.S. Capitol building. Beyond her, you can see a full-length statue of George Washington, flanked on either side by Eve After the Fall, and Adam and Eve after the Fall. 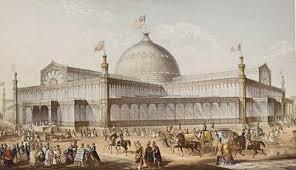 The lithograph below shows the original rotunda when the fair opened in l853. Occupying the central position at that time was an equestrian statue of George Washington. There’s a good account of the Palace’s wavering fortunes in Curbed NY. Thank you New York Public Library, New-York Historical Society, Wikipedia and Tumblr.